Silva Saga has some locked doors, like this one. They also pop up in the earlier game, Minelvaton Saga. Obviously, in a console or computer RPG, you can’t have the same freeform potential for exploration. You do get things like secrets tucked away at the edges of the map. You do get Metroid esque “can’t get here yet” style barriers. Some games also encourage you to stay on roads (to reduce encounters) or force you to search to find areas. The Wild ARMs series even hides locations from you until you get the directions to find them and are able to search in the correct area. In older games, some dungeons or towns seem to be designed so you can have the wonder of exploring the area. Consider Dragon Quest II. It tends to not provide great treasure, and you quite often have to make very long treks to get to various areas. You do get a feel of accomplishment when you manage to get to that far away town. You also get extra levels from exploring a useless dead end. However, the pacing of the game often feels like the game wants you to be amazed by the sheer amount of stuff, no matter how uninteresting. 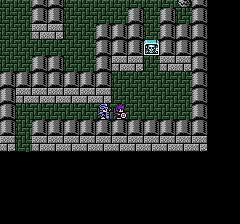 The top of this tower in Dragon Quest II has an empty chest. Some games provide minimal information. This could be due to translation errors, space issues, or simply a wish to throw the player into the world to explore. Dragon Quest games tend to unlock a massive part of the world when you get a ship. This usually amounts to having a massive sea filled with much more deadly enemies and little idea of where to go. Often you end up finding later game stuff (ominous rooms with poisonous gas and locked doors) or little towns that aren’t yet relevant to the plot. Final Fantasy III (NES) has a similar expanding world, but it tends to lock you out of exploration once you find your next plot area. In my opinion, some games don’t have enough exploration. Take the Hack//sign series. In the first games, you end up having a good amount of grinding to do, a number of randomized worlds to play around in, but nothing to find. Your inventory fills up with items that you mostly have to sell. Dungeons offer the same basic stuff. The overworld maps in the randomized worlds wraps, and has a short view distance, making it hard to get your bearings. The game rewards repeating actions (data draining monsters, killing all monsters in an area, etc.) However, these actions tend to have similar results, making it not that exciting to actually do. I think you could argue that the SaGa games suffer from this too. They tend to offer you a lot of things to try to do, but if you’re not skilled with the game system, they’re all annoying in their own ways to actually try to complete. In some blockbuster RPGs, there’s not a lot there in the game. You have tons of content if you’re following the plot, but if you head off to explore, there’s nothing to find. Now, obviously, this means that following the plot gives you a much more polished and exciting experience, since there wasn’t time spent on anything else. However, if you want to grind, you’re stuck running in circles and if you don’t like the area of the plot, there’s no where else to go. In Rogue Galaxy, there’s a starting area in a desert town. You run around, and eventually meet the mid boss. There’s generous save points and healing, so you can get to this mid boss at a fairly low level. If you’re not great at the game, it’ll destroy you. This means you have to spend time running around the streets and upgrading your various equipment until you’re a high enough level to handle the monsters. Once you hit that level, the actual boss isn’t that bad at all. One complaint about computer and console games is that they don’t let you explore. I think this is – odd. After all, games spend a lot of time trying to render plot important areas. Early RPGs and really bad RPGs tend to offer comparitively boring areas and cookie cutter designs. However, you can find evocative and impressive structures and landscapes. So you can’t say that there’s no exploration of locations. Now, you can say that you can’t go anywhere you want, but that again doesn’t mean there’s no exploration. A GM may make all roads lead to Rome, or offer something interesting if you run off in a direction. A game may limit your exploration or have all plot threads point you to the Rome in question. A game may also provide something interesting if you go off the path to Rome. While you can find boring areas that do nothing of interest, that doesn’t mean that a game isn’t letting you explore. It’s simply not rewarding that specific type of exploration. 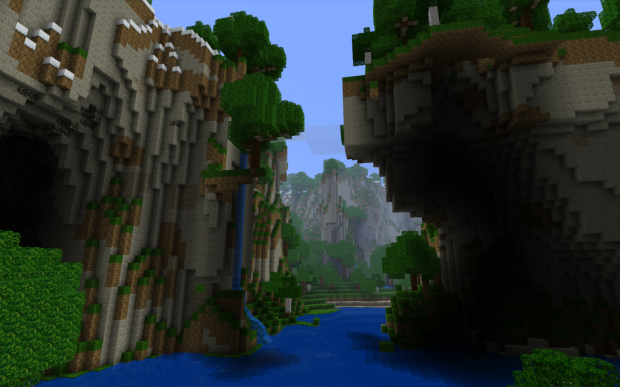 Moist von Lipwig took this screenshot of a Minecraft world. Due to how seeds work in the game, you could create an almost identical world using the same seed. Look at Minecraft. There’s minimal concrete goals in the game. It’s mostly centered around letting you decide to build or map out an area. You can end up searching for specific items. So, say, sugar canes spawn on dirt or sand near water. This means if you need the canes to make paper, you have to hunt up and down the coastlines for the plants. You can build farms and harvest the crops. It’s not exploration in the sense of a GM directed path to interesting stuff. Instead, it’s exploration in the sense of finding a new world, mapping it out, and deciding to make an area yours. You can do the same thing as you fumble around lost in the ocean in a Dragon Quest game. You can do the same thing as you stagger back to a town to heal up after terrible fights. In Nostalgia (DS) you head back to London to get new quests and to rest up after travelling. You can have that same “I’m back in my home base” feeling in a pen and paper game or even in Minecraft.